I can't imagine if we possible to give or transfer money via any messenger applications. It is sound freak but i was true now. 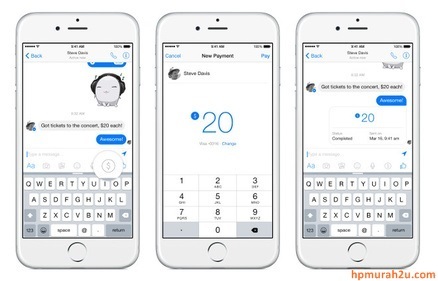 After Facebook announced its payment transaction features which is dubbed peer-to-peer via Facebook Messenger a few months ago and now it becomes reality. But, not for the all Facebook users,it is only in America. They now can transfer their money from Facebook Messenger to their friends easily. The good news has announced by David Marcus. He said" Add your Debit Card and pay anyone on Messenger in a few taps. Money go straight from your checking account to recipient's checking account. Easy and safe"
Before this announcement made,the peer-to-peer feature is recorded to downloaded for more 1 Billion. Could you imagine how many payment transaction per day? Hope this feature to transfer money from Facebook Messenger will be a sake for them. 1 Comments for "Transfer Money From Facebook Messenger released"